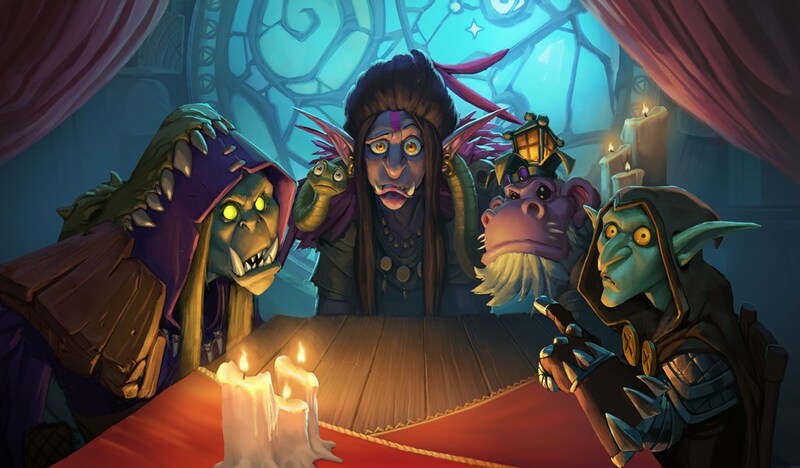 A new expansion is upon us, which means Hearthstone players are itching to craft some goodies. Although you should always craft with caution, here are a few cards that are certainly worth your dust. If you thought Mech Hunter was gone forever, then you’ve been misled. Mechs are back in a big way overall this expansion and one of the most powerful cards to join their ranks belongs to the Hunter class. Oblivitron’s Deathrattle allows you to summon a Mech from your hand while simultaneously triggering its Deathrattle. This card nearly single-handedly created the Mech Hunter archetype that has seen success on ladder over the past few days. Although the Mech Hunter deck list may change as the expansion progresses, you can expect this card to be in every version. If you’ve spent time on competitive ladder during the first few days of the expansion, then you probably know all about Blastmaster Boom. One of the most successful decks on ladder right now is the new Bomb Warrior archetype—but that isn’t the only place you’ll be finding the Blastmaster. 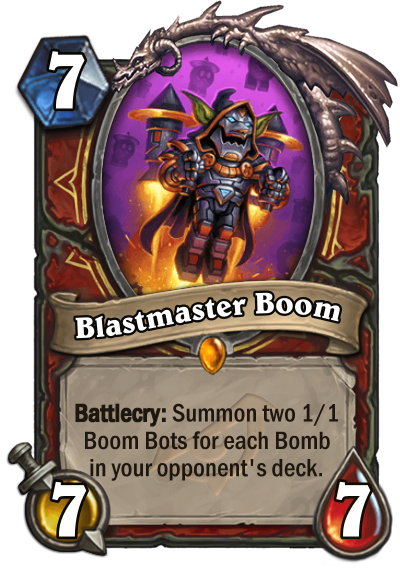 Although he definitely works best in Bomb Warrior, other Bomb-related cards have been making their way into more standard control decks that focus less overall on the Bomb strategy. If you play the Warrior class at all, you can consider Blastmaster Boom worth your dust. Another deck you’ve probably seen this week on ladder is Token Druid. While this card definitely goes best in Token Druid, that isn’t the only Druid deck we expect to find this bad boy in over the next few months. 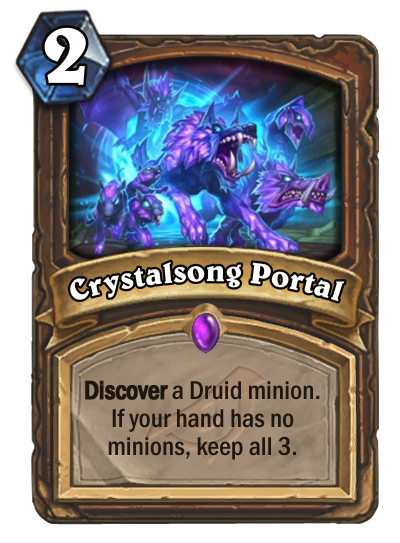 Crystalsong Portal allows you to discover a Druid minion and to keep all three if you have no minions in your hand already. Although archetypes are still being hatched out, this card will more than likely have a slot in various Druid decks moving forward. Not only is the card great for decks like Spell or Token Druid, but you could even find a place for it in most Aggro Druid decks as a way to repopulate your hand. Crafting legendary cards is always risky business due to their high dust cost. But risky business might as well be Heistbaron Togwaggle’s middle name. One deck that has dominated the early days of Rise of Shadows is Tempo Rogue. While many of the cards making up the deck are from expansions that pre-date Rise of Shadows, the main ingredient of the new version of the deck is Hestbaron Togwaggle. 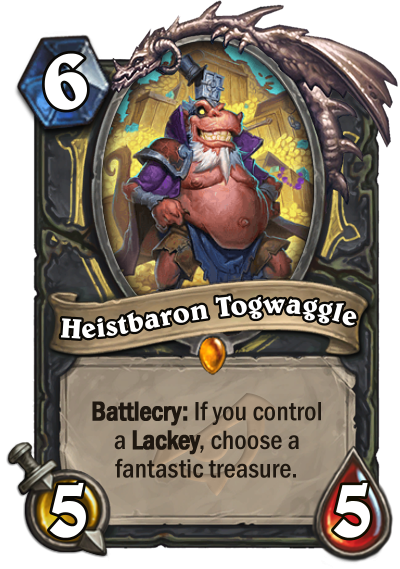 Not only does the card have decent base stats, but Togwaggle’s Battlecry will award you with a fantastic treasure as long as you control a Lackey. Although Tempo Rogue is where Togwaggle resides right now, you can expect to see this card in most Rogue decks going forward. If you’re bummed out by the nerfs Druid received during Rastakhan’s Rumble, then it’s time to raise that chin up. Now that Rise of Shadows is here, it appears that the nerfs came to set up Druid for a variety of new playstyles. Keeper Stalladris is perhaps one of the most powerful cards that has ever been available to the Druid class. 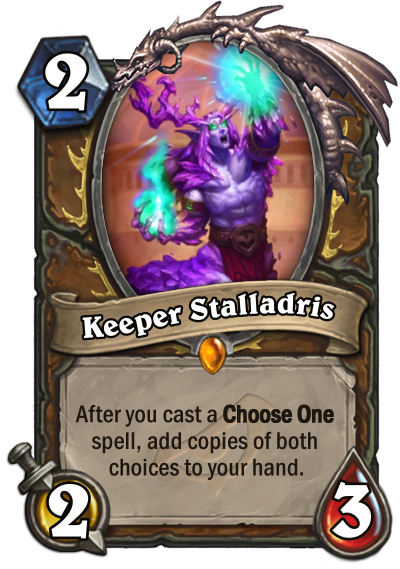 Stalladris has an ability that allows you to add copies of both choices to your hand after casting a choose one card. As if this ability wasn’t great enough on its own, Stalladris has a super low mana cost and decent base stats. If you play Druid, it’s safe to say you’ll be using Keeper Stalladris during this expansion. Spending all that dust you’ve collected from disenchanting old cards can be very fun and appealing. 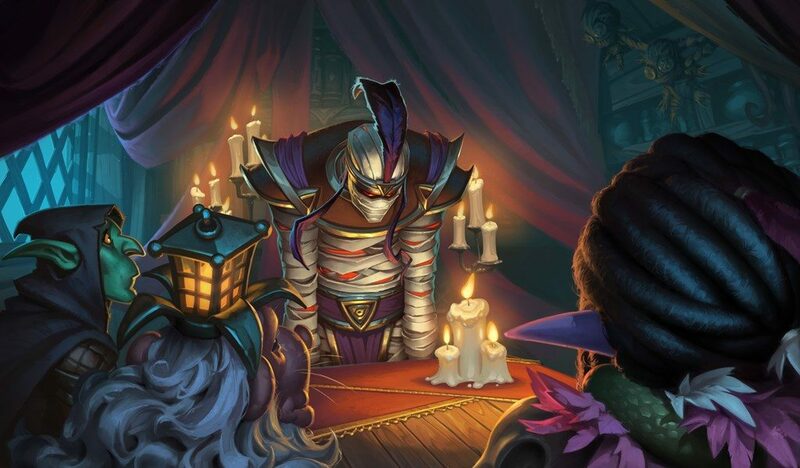 It’s important to remember, however, that Rise of Shadows has barely been out for a week—so the current meta probably doesn’t reflect what the actual meta will be. That being said, the cards on this list generate so much value that they’ll likely be used in a variety of decks associated with their class. If you don’t see an interesting card from your preferred class, don’t get discouraged. Every class has excellent new cards joining their ranks with Rise of Shadows—the community just needs time to figure out how to use them.